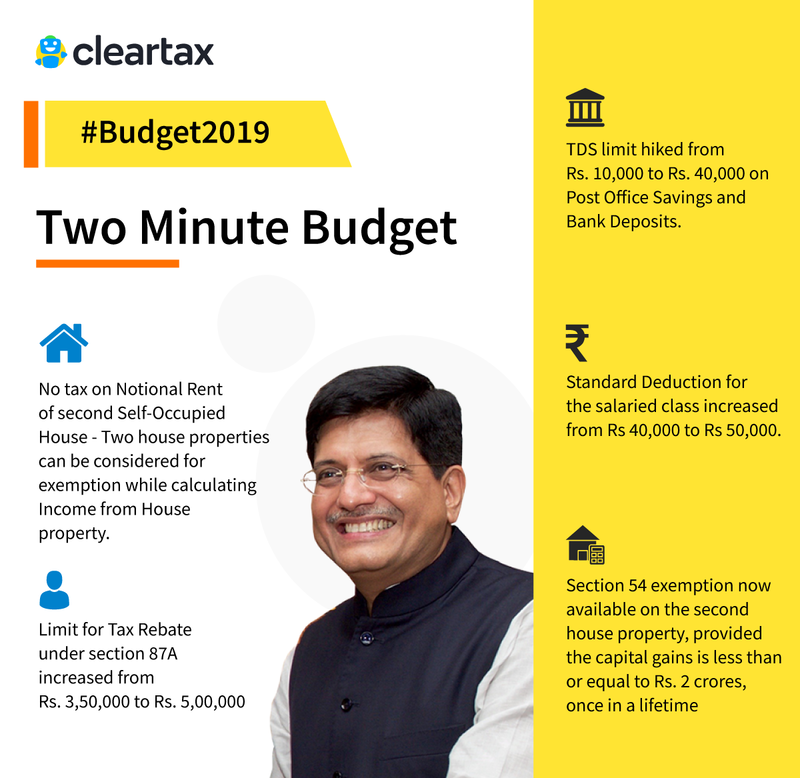 The Union Interim Budget 2019 was presented by Finance Minister Piyush Goyal on 1st February 2019. The Budget session began at 11 A.M.
Income Tax slabs will remain the same for FY 2019-20. No tax on notional rent of second Self-occupied House under “Income from House Property” (up to two self-occupied house properties) to be considered for exemption. Tax Rebate Limit under 87A increased from Rs. 3.5 lakhs to Rs. 5 lakhs for taxpayers. The maximum limit of the tax rebate increased to Rs.12,500 from the present limit of Rs. 2,500. TDS limit hiked from Rs 10,000 to Rs 40,000 on Post Office Savings and Bank Deposits. Standard Deduction for the salaried class increased from Rs 40,000 to Rs 50,000. Section 54 exemption now available on the second house property, provided the capital gains is less than or equal to Rs. 2 crores – to be availed only once in a lifetime. Benefits under Section 80-IBA to be extended for one more year – to the housing projects approved till 31 March 2020. Period of exemption from levy of tax on notional rent, on unsold inventories is extended from one year to two years, starting from the end of the year in which the project is completed. SMEs with earnings below Rs 5 Crores will soon file GST returns only once in 3 months. MSMEs and Traders to note that GST Registered SME units will get 2% interest rebate on an incremental loan of Rs. 1 Crore. The requirement of sourcing from SMEs by Government enterprises has been increased to 25% with 3% reserved for women-owned SMEs. A scheme of ‘Business loans up to Rs. 1 crore in 59 minutes’ will be implemented. 60,000 crores are being allocated for MGNREGA in Budget Expenditure 2019-20. Additional amount would be provided if required. Providing cleaner fuel for rural women – out of the 8 crores promised free LPG connections, 6 crores is already delivered under Ujjwala Yojana and remaining will be delivered in the coming year. More than 7,000 beneficiaries of PM Mudra Yojana are women. 15.56 crore loans of ₹7.23 lakh crore disbursed under MUDRA Yojana. Benefits of maternity leave of 26 weeks have provided support to women. Outstanding loans of public sector banks increased from Rs 18 lakh crore to Rs 52 lakh crore. Under the clean banking initiative, the 4R approach i.e. Recognition, Resolution, Recapitalisation and Reforms is being followed. 8 public sector banks still remain within PCA framework which imposes restrictions on lending and expansion. IBC has instituted a resolution-friendly mechanism to speed-up recovery of NPAs. Consequently, Rs 3 lakh crore has already been recovered to this effect. A sum of Rs 2.6 lakh crore has been directed towards recapitalisation of Public Sector Banks (PSBs). Amalgamation of banks in place to avail economies of scale, better capital and wider geographical coverage. Benefits to 10 crore workers in the unorganised sector as part of the Mega Pension Yojana. Contribute Rs. 55-100 per month and govt will contribute the same – to get Rs. 3000 pension monthly post 60. Over Rs 35,000 crore has been allocated under the ‘One Rank One Pension’ scheme for Defence personnels. Minimum Support Price (MSP) fixed at 50% more than the cost for all the 22 crops. Pradhan Mantri Kisan Samman Nidhi (PM-Kisan) to benefit around 12 crore small and marginal farmers with direct income support of Rs 6000 annually. Rs 75,000 crore has been allocated to this. The amount of interest subvention has been doubled and crop loans to farmers increased to Rs 11.68 lakh crore. Allocation for Rashtriya Gokul Mission increased to Rs 750 crore. Rashtriya Kamdhenu Aayog has been established to genetically upgrade cow resources. Under Kisan Credit Card scheme, farmers pursuing animal husbandry and fisheries will get 2% interest subvention. An additional 3% interest subvention will be provided for timely loan repayment. Under National Disaster Relief Fund (NDRF), farmers affected by natural calamities will get 2% interest subvention. A prompt repayment incentive of 3% will be given for the entire loan reschedulement period.